Pressure-packed and chaotic only begin to describe the life of a player traded just before the deadline, acquired at huge cost to lift a team over the top. One problem: These late-season pickups only seldom pay off. So why do teams keep mortgaging their futures on them? Springtime hockey can be a powerful (and lucrative) inducement. The Seven Samurai of Kurosawa traversed dirt roads and deep forests in open-toed sandals to reach the Japanese village they had been called upon to rescue. By comparison, the mercenaries of Columbus—former Senators forwards Matt Duchene and Ryan Dzingel—ate snacks, played cards and toasted Bud Lights aboard a King Air 350i twin turboprop, outfitted with heated leather recliners, a "built-in refreshment center" and cabinwide noise-cancelling technology. In fairness, the newly traded Duchene had been awake since 6:30 a.m. on Feb. 24, first catching a commercial flight back to Ottawa, where his wife, Ashley, was packing up their old home. That afternoon, beneath a downpour on the tarmac, the once (and now again) teammates had stuffed the private plane with nearly a dozen suitcases and other luggage, including Dzingel's refrigerator-sized duffel of hockey sticks. Next, the group—including Ashley; their six-week-old son, Beau; and floppy-eared family dog Paisley—white-knuckled through a windy layover to clear customs in Buffalo before touching down in Columbus and arriving at a downtown hotel in two Suburban SUVs around 9:30 p.m.
"Not everything fit, either," Duchene says. "We had to ship a bunch of baby stuff: the stroller, the rocker.... That was a long day." Such is the chaotic existence of an NHL rental, those annually hired guns whose skills, coupled with expiring contracts, attract trade-deadline suitors with an eye toward the playoffs. Three days earlier Duchene and Dzingel had been waiting out their inevitable exits from last-place Ottawa, benched to safeguard against injury. 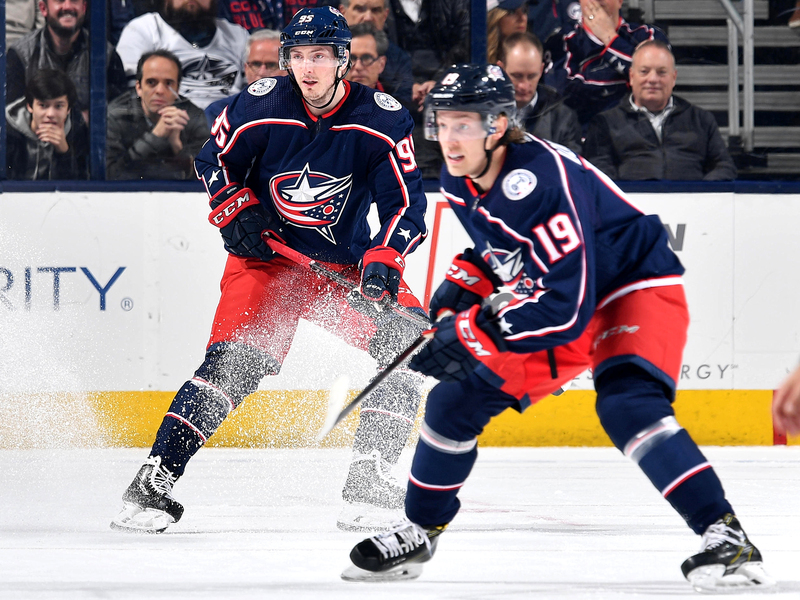 After separate moves made 36 hours apart, they reunited with a clear mission: propel the on-the-bubble Blue Jackets, who haven't won a playoff series in their 18-year history, into the postseason—and beyond. "It's daunting and humbling at the same time," says Duchene, the prize catch of the 2018–19 rental bazaar, fetched for a first-round pick and two prospects, plus a conditional first if he signs with Columbus. "You feel like, 'Geez, I'm worthy of that?' Then you're like, 'Geez, O.K., now I have to live up to that.'" Judging solely by Stanley Cups, very few do. Over the past 15 years, according to recent research from The Athletic, only two of 29 high-priced rentals (whose cost included a first-rounder) ended up hoisting the ultimate prize with their new clubs: Tomas Kaberle with Boston in 2011 and Antoine Vermette with Chicago in '15. "My record is terrible with that," admits Nashville GM David Poile, who has peddled four such picks in that span, tied for the league high, to no avail. "If you look historically, sometimes it's hard to justify all of these transactions we make. But that's the fun part. We all hope this one deal might be the difference." And so they keep trying. Poile rang the starting bell this season, landing the Devils' beefy center Brian Boyle (2019 second-round pick) and the Rangers' beefier winger Cody McLeod (2020 seventh) on Feb. 6. Seventeen other rentals followed suit before the Feb. 25 deadline, more than any year since '12–13, when GMs went buck wild with 27. The phenomenon isn't unique to hockey: Big MLB names such as Justin Verlander, Yu Darvish and Manny Machado have functioned as recent short-term hires, while the NBA's Raptors recently acquired soon-to-be free agent Marc Gasol. Relative to roster size, though, no other sport's suits whip around expiring contracts as often as the NHL's. But why mortgage future assets on just hope? Why take the risk for such rare payoffs? "How long do you want the list to be?" Poile says. "There are so many factors. You might be making your deal just to get in the playoffs, and you might be making your deal as a last piece that you think could get you all the way to the Stanley Cup. It's a bit of an arms race. The rental trades are absolutely the hardest to make." Twelve days before the 2006–07 deadline, Poile paid a hefty sum—two former first-rounders in Scottie Upshall and Ryan Parent, plus a future first and third—to snag Peter Forsberg from the Flyers. The relationship was brief on paper; Nashville lost in the opening round, and Foppa signed with the Avalanche that summer. Even so, Poile reflects on the trade with fondness, like a summer camp fling. In 28 home games before acquiring the future Hall of Fame center, the Predators had just five sellouts with an average attendance of 14,695; over the final 13, they sold out six times while drawing 16,475 per night. "Peter put the Predators on the map and gave us a bit of swagger," Poile says. "Sometimes you bring on a player and the effect goes right through your organization." That is what the Blue Jackets were hoping, at least. Not only did GM Jarmo Kekäläinen decide to keep winger Artemi Panarin and goalie Sergei Bobrovsky—even though both stars evidently prefer to leave as free agents on July 1—but he also doubled down on expiring contracts to address needs at left wing (Dzingel) and second-line center (Duchene), then added insurance policies in defenseman Adam McQuaid and goalie Keith Kinkaid. The final bill: three 2019 draft picks, three (perhaps four) future selections and four players under age 24. "If I had moved Panarin and Bobrovsky, everybody in our fan base and city would've said, 'F------ Blue Jackets, all they ever do is just trade for picks and tell us we're going to be good in the future, just wait, be patient,'" Kekäläinen says. "No, we wanted to send a message to the fan base and the locker room that we're serious about winning." Indeed, for teams like Columbus—or the playoff-bound Hurricanes and Islanders, all teams ranked among the bottom-five in total 2017–18 NHL revenue, according to Forbes—the right last-minute addition can help an organization gain more secure footing. Even as it briefly throws the lives of those involved into utter disarray. Jolted awake by a fire alarm, the new guy hustled onto the sidewalk outside the Westin in downtown St. Louis. It was nearly 3 a.m. on Feb. 26, the morning after the deadline. 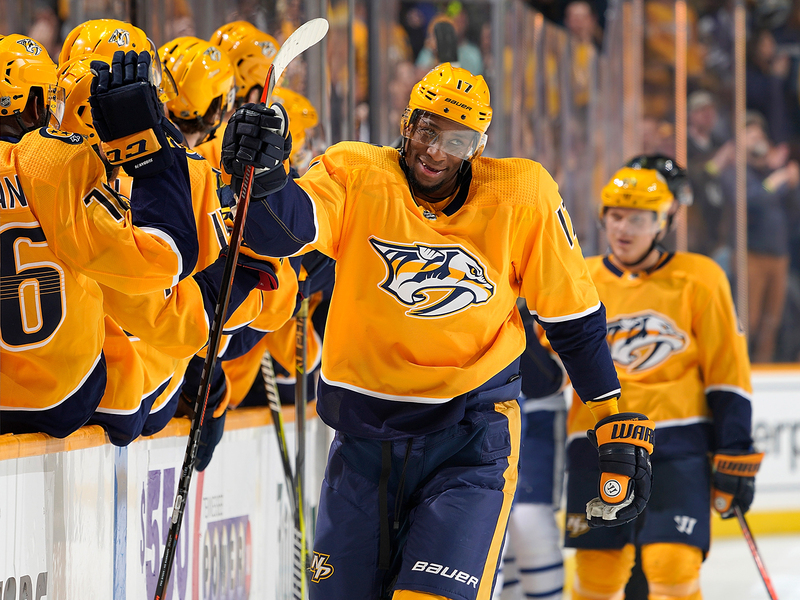 Most of the groggy-eyed Predators were solely focused on returning to their hotel beds as soon as possible, but winger Wayne Simmonds saw an opportunity to schmooze. "That was the first time I had met everybody on the team," says Simmonds, who learned of his trade from the Flyers—finalized exactly two minutes before the deadline—on the TV news crawl. "Not the ideal situation, but I think it was fitting." No rental enjoys an entirely hassle-free transition. Wingers Marcus Johansson (Devils to Bruins) and Mats Zuccarello (Rangers to Stars) are this year's extreme examples, respectively suffering a bruised lung and a broken hand upon joining their new teams. Smaller life hurdles are more common. Simmonds struggled to find a place in Nashville that allowed his two Dobermans. And Duchene's family had to settle for a smaller room because their Columbus hotel was overtaken by attendees of the Arnold Sports Festival, Schwarzenegger's annual muscle-head expo. "I knew everyone's name on the team already," says Capitals winger Carl Hagelin, who joined the reigning champs on Feb. 21 after facing them in three straight postseasons with Pittsburgh. "But nicknames? That's probably the toughest part." Until the 2004–05 lockout, the trade deadline fell 26 days before the end of the regular season, a dozen games before the playoffs. The ensuing collective bargaining agreement bumped up the cutoff by two weeks, 40 days out, in part to give players more time to acclimate. "The biggest thing for me is the integration factor," says Sharks GM Doug Wilson, whose recent rental hauls include wingers Evander Kane ('17–18) and Gustav Nyquist (Feb. 25). "There's very limited practice time. Whoever you bring in needs to have familiarity with your organization or great hockey sense. You fill a need, but also he's the type of person that can fit in your group." Of course, a welcoming locker room always helps. Wilson happily notes how veteran Joe Thornton picked up winger Evander Kane at the airport when the latter arrived in a big-ticket trade from Buffalo last March, and that Swedish defenseman Erik Karlsson did the same for countryman Nyquist after this year’s deadline. But the small window and big stakes often form a recipe for pressure. In hindsight, goalie Dwayne Roloson represented a mercenary success story, backstopping Edmonton to the 2006 finals. (Roloson got hurt in Game 1 against Carolina, and the Oilers lost in seven.) But upon arriving, Roloson was shelled for 13 goals in three losses. "I was overreacting to a lot of shots, trying to make the big save," says Roloson, who found himself repeating keywords and performing breathing rituals between whistles as a way to mentally cope. 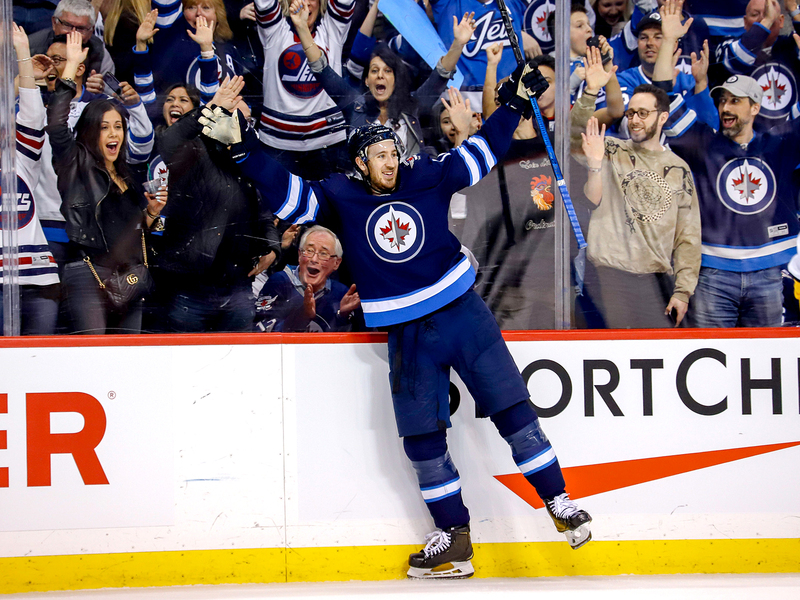 "I wanted to show my team, ‘There's a reason why you traded for me.’"
In case any skeptics had been lingering around greater Manitoba, the full case for Winnipeg's addition of Kevin Hayes from the Rangers was laid bare on March 23. Hosting divisional rival Nashville at Bell MTS Place, the 26-year-old center dished three assists to new linemate Kyle Connor and clubbed a spin-o-rama slap shot past goalie Pekka Rinne for good measure, pacing a 5-0 win that clinched the Jets' playoff berth. The rangy Hayes didn't come cheap—only he and Duchene fetched first-rounders in 2019—but his two-way strengths have seamlessly blended with Winnipeg's heavy, north-south style. It is the second straight season that Jets GM Kevin Cheveldayoff has scored a gem on the rental market; center Paul Stastny registered 15 playoff points as Winnipeg reached its first Western Conference final last year. "I just focused on trying not to overdo it," says Stastny, who went on to sign with Vegas. "You want to be the missing piece, but a lot of the puzzle is already put together." Which explains why, often, the most effective additions aren't the splashiest. Like defenseman Ron Hainsey, whose presence helped Pittsburgh survive Kris Letang's herniated disc in 2017. Or Capitals blueliner Michal Kempny, who went from a healthy scratch in Chicago to a vital contributor on a title team last spring. The reigning champs appear to have found a similar bargain in Hagelin, an ace penalty killer whose contributions (10 points through March 31) have outweighed the cost (a third-rounder plus a conditional sixth). As the regular season winds down, though, all eyes are on all-in Columbus. The Blue Jackets spent most of March battling for an Eastern Conference wild-card spot and the chance to get walloped by Tampa Bay in the first round. Even so, playing hockey in April sure beats playing golf. "If it doesn't pan out, everyone will be coming after my head," Kekäläinen says. "But I'd still do it over again, because it gives us the best chance this spring." For his part, Duchene estimates that it took nine games to "feel comfortable" in the new on-ice surroundings. The rest of the move was much smoother. He and McQuaid formed a bond while attending team chapel. The baby stuff shipped on schedule. And his family eventually relocated to a downtown condo owned by winger Cam Atkinson. Aside from some household essentials they picked up—pillows, bedsheets, garbage cans—the place has aptly been outfitted with rental furniture.